Living in a small space, like a tiny house, apartment, or a dorm, doesn’t mean you can’t dream big when it comes to creating delicious meals, and today’s guest post and recipe is excerpted from a cookbook by Adams Media that’s designed to help you do just that! No need to curb your big appetite in a tiny home — the recipes in Tiny House Cooking: 175+ Recipes Designed to Create Big Flavor in a Small Space are uniquely designed to be made in the micro-kitchens of tiny homes and apartments, since many tiny homes have only two burner stove tops, a mini-fridge, and no microwave or oven. At first glance, this may seem like a challenge, but Tiny House Cooking proves how easy cooking in a tight space can be! All the recipes are designed to be cooked on a two-burner cooktop so there is no need for other appliances, like ovens, toaster ovens, or microwaves, that often take up valuable space in your kitchen. The recipes use very few pots and pans because in a tiny house you need to make the most of your kitchen space! These recipes use only fresh and canned foods because freezer space is often at a minimum. You don’t have to sacrifice when it comes to cooking in your tiny kitchen. With a little forethought and some careful prep, you’ll be enjoying delicious and satisfying meals from your kitchen, no matter what its size! Remove the stems from the chard; chop them finely. Heat 1 tablespoon olive oil over medium heat in a heavy-bottomed Dutch oven or large skillet. Add the chard stems, red onion, carrots, sweet potatoes, root vegetables, parsley, lime juice, cilantro, salt, and pepper. Cook, stirring occasionally, until the root vegetables are fork-tender, about 5–8 minutes. Meanwhile, bring a large pot of salted water to a boil. 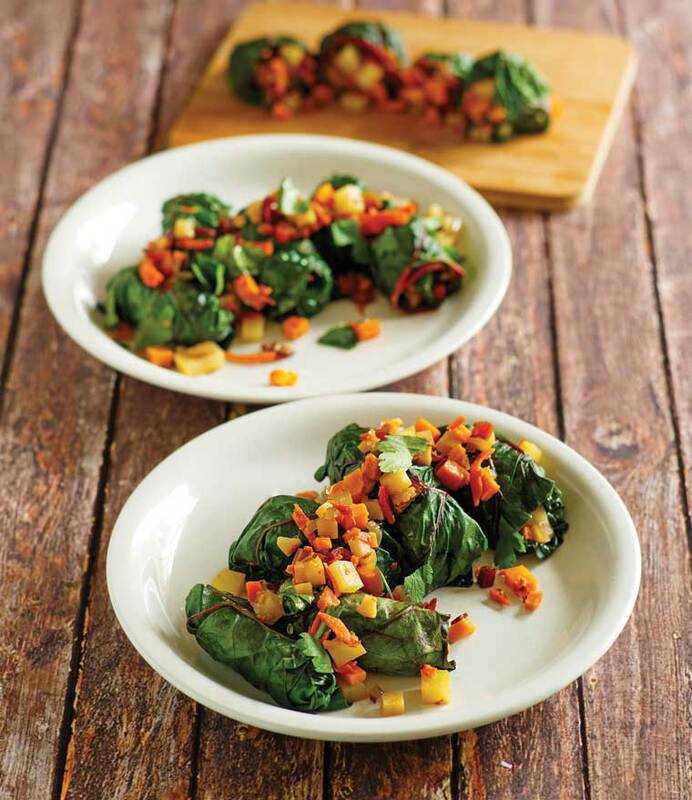 Blanch the chard leaves 3–4 minutes, then drain and cool. Spoon 1/4 cup of filling onto the stem end of a chard leaf. Fold in the sides to envelop the filling; roll away from yourself, keeping even tension so the rolls remain plump. Use the remaining olive oil to grease a medium skillet. Line up the rolls in the skillet; add stock. Cook 10 minutes over medium heat; serve garnished with remaining filling. 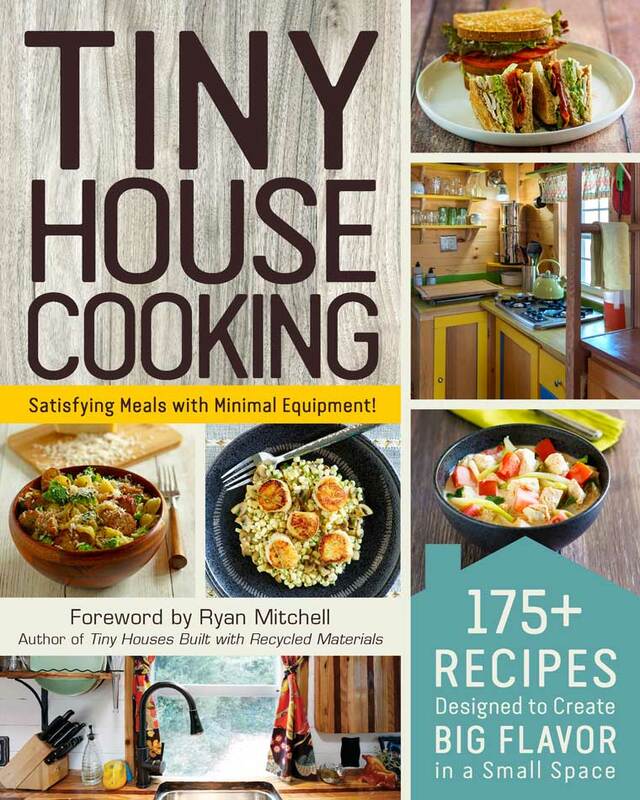 Excerpted from Tiny House Cooking: 175+ Recipes Designed to Create Big Flavor in a Small Space by Adams Media, with a foreword by Ryan Mitchell, founder of thetinylife.com. Copyright © 2018 Adams Media, a division of Simon and Schuster. Used by permission of the publisher. All rights reserved. Photographs by James Stefiuk. Wow it looks very delicious can’t wait to eat i am a big fond of to eat good and healthy food love it thanks for the recipe.